The Masters programme has a requirement of 60 ECTS and is organised into 3-day modules for a total of 12 modules (40 ECTS), among which 7 on-campus and 5 full online. The modules combine lectures, talks by experts from Research Infrastructures and guest speakers, webinars and case study analysis. The total duration of the Masters is 18 months. The second iteration will run from 13th November 2018. 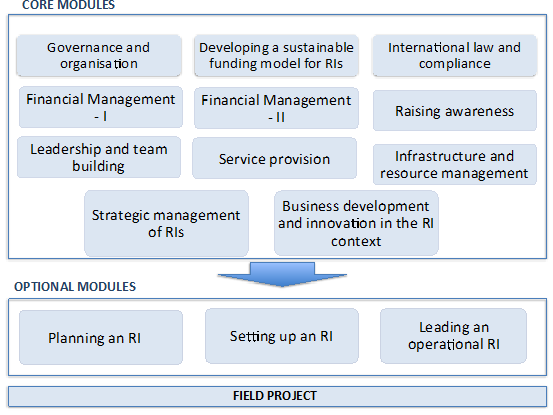 Participants completing the full programme are required to work on field projects (20 ECTS) – individual or team projects that draw on specific needs of RIs – under the supervision of faculty members. These projects will enable participants to concretely apply managerial tools and methods to benefit their organizations. Some examples of these are: writing a business plan for a new RI, creating a sustainability model, defining a new project or service, developing a new communication strategy, developing a data management plan or a disaster mitigation plan. The Masters programme is composed of eleven core modules and one optional module to meet the needs of Research Infrastructures at different phases of development.